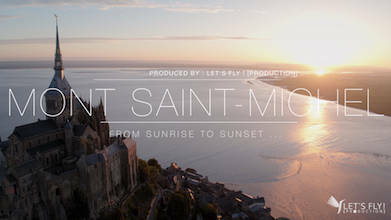 Let’s Fly Productions takes us on an aerial tour of one of the most iconic locations in France, the exquisite Mont Saint-Michel monastery which lies on an island of the same name. The site of fortifications dated to the 6th century, the tidal island withstood enormous pressure but was not conquered during the Hundred Years War. This extraordinary UNESCO World Heritage site, also known as the 'Wonder of the West' can now be enjoyed from every angle in this remarkable drone film. Description: Le Mont Saint-Michel is a MONUMENT. This short aerial video is dedicated to show how astonishing is that unique UNESCO World Heritage as there are no other in the world, from sunrise to sunset.